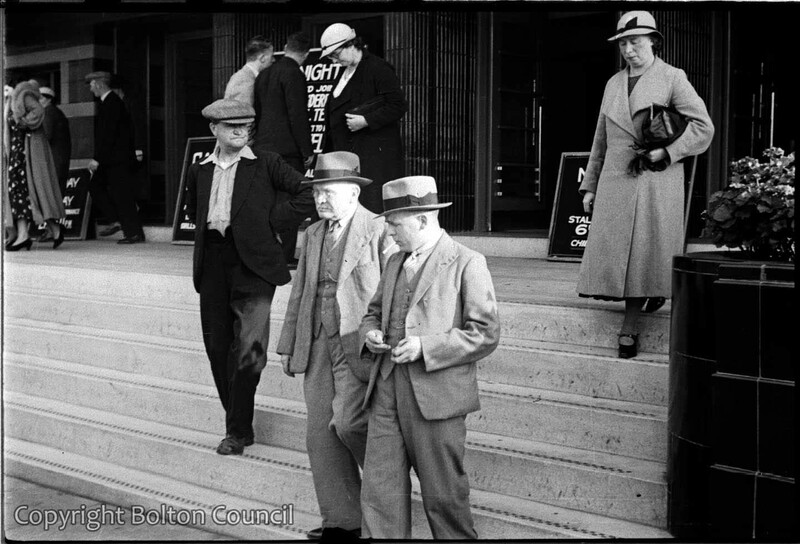 Cinema goers on the steps of Bolton Odeon. The cinema had opened only a month before this photograph was taken. On this day (27th September 1937) the Odeon was hosting a special event featuring comedian Sandy Powell and footballing stars from local team, Bolton Wanderers. The building was demolished in February 2007 to make way for a new development. As of August 2012 no building work has started. I can remember in the 60’s the Odeon was Bolton’s main cinema. I watched many a film in the Odeon “Jungle Book”, “Mary Poppins” and many other childrens films on a saturday afternoon. Later on as I was in the Thornleigh brass band we also made concerts in the Odeon or the Town Hall, also with our musical group showing “My Fair Lady” or other musicals. These musicals were very interesting that time because as we were an only boys school, usually younger boys with higher voices had to play the feminine rolls in the musicals. We had one boy he had a fantastic high voice when singing. After the cinema we went to the Bolton bus station and while waiting for a bus towards Hulton Lane we got a hot cocoa for six pence from a coffee maschine in the bus station. Very nice in the winter months. The Odean club on Saturday mornings in the 60s was brilliant for us kids. Lots of old films (3 stooges etc) and entertainment. It was the first place we were allowed to go unaccompanied by adults and we all felt ‘dead grown up’. Everyone loved the Odean, it seemed luxurious and special.